The Kodo Cultural Foundation’s recent change to become a public interest corporation was made in response to an amendment called the “Public Interest Corporation Reform” made in 2006 to a civil law created 110 years prior regarding charitable corporations. Since the Meiji era, public-service corporations operated under the rule of government officials, and the Japanese government recently cast off this regulation so these corporations would belong to the citizens, be run by the citizens, for the citizens. Furthermore, two types of legal entities were created by the new system. One is the “General Incorporated Foundation,” which can be founded regardless of its level of public interest, and the other is the “Public Interest Corporation,” which an administrative agency must authorize as having public interest based on the opinions of a committee of civilian experts. Being recognized as a public interest corporation is beneficial to the organization as it makes it immediately clear that its activities are “public interest.” Also, activities recognized as projects to benefit the public are exempt from tax, which paves the road to becoming certified as a tax-exempt organization called a “Special Public Promotion Corporation.” For us, this would mean that people who join Friends of Kodo or make donations to our foundation could apply for tax credit. Projects devised for the promotion of performing arts culture through research and study of traditional culture. Projects that cultivate practitioners of performing arts culture and activate local communities through in-service training or practical learning. Projects devised to energize local communities through international cultural exchange and use of local resources. Other projects deemed necessary to reach the goals of this corporation. We believe that the revival of traditional performing arts is an important element in reenergizing local communities in areas affected by Tohoku Pacific Earthquake, a tragedy that interrupted the practice of such arts and related festivals. Kodo Cultural Foundation is leveraging its experience to date by supporting the collection of records and provision of information about festivals. We will continue to support the revival of these performing arts through data collection interviews, festival equipment repairs, etc, so that the feelings and memories the people of Tohoku have regarding their festivals will not fade. We have visited areas that were damaged in the Tohoku Pacific Earthquake, spent a great deal of time communicating with people in the communities there, conducted interviews, built relationships, etc., so that we can effectively promote the revival of their traditional performing arts. In 2011, we registered our foundation as a Class 3 Travel Industry. We began tourism operations because we believe that tourism has the power to bring life back to the communities that hold traditional culture and performing arts at their core. Local areas become energized as local people welcome outsiders, which in turn activates the economy of the villages and allows locals to rediscover the value of their local resources of history, culture, nature, etc. We hope that this will result in a new resolve by locals to tackle the challenges of preservation and make better use of their resources. 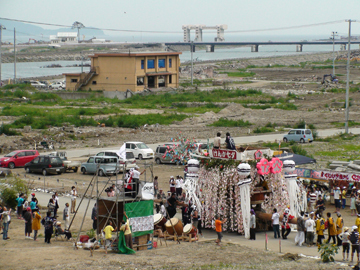 In 2012, Kodo held its first long-season performances on Sado Island. Our foundation worked with locals in the area to develop and implement new tourism initiatives through these performances. 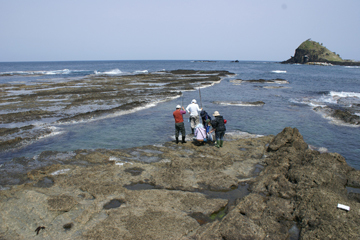 Ogi Peninsula is attracting attention recently as a Geo Park. Presently the value of this is being rediscovered by the locals, and they are thinking about how to make the most of it as a tourism resource. To achieve the two main goals of “Promotion of Performing Arts Culture” and “Revitalization of the Local Community,” Kodo will use its experience to date and network as a base, and implement projects with these four platforms of activity. Through our research and practical experience focused on the performing arts and lifestyle culture on Sado Island, we will suggest leveraging traditional culture that can be applied to modern society. Festivals are not only a way of dedicating performing arts to the gods, they are also rites of passage through which young people learn their local history and customs, and a strong bond is created between people in the community. With the Kodo Cultural Foundation Apprentice Centre as the core, we endeavor to cultivate young people who have have a rich curiosity and a desire to uphold arts and culture for the betterment of their local communities. We will also create occasions for Kodo to pass on the know-how it has fostered to future generations, such as offering taiko and other traditional performing arts workshops and regional hands-on experiences. Providing fulfilling, precious experiences to study things that cannot be learned in an urban lifestyle. 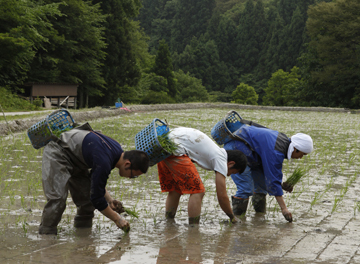 These include learning the pleasure of connections with nature and feeling the spirit of helping and receiving help through communal work. Starting from Ogi, Kodo’s home base on Sado, and expanding to the rest of the island, we will work with local people and administrative bodies to promote tourism, develop special local products, preserve and utilize historic architectural areas, and make a use of abandoned schools. We will promote making a new style of Sado tourism using our travel knowledge and unique abilities. 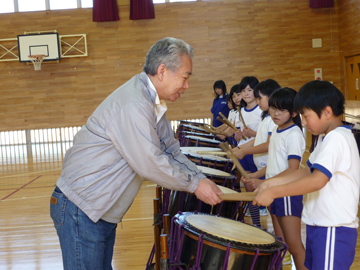 Taiko group “Misaki Taiko” has held its practices in the gymnasium of the former Fukaura Primary School since it was closed in 2011. 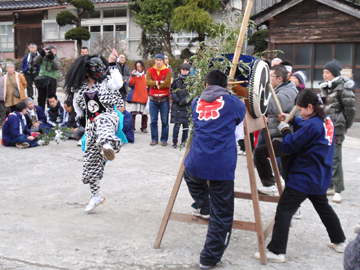 Even without the school operating, the group has continued its activities as a local performing art. We produce the international performing arts festival Earth Celebration (EC) and assist KASA (a non-profit organization created by Kodo and North American taiko representatives) as well as the North American Taiko Conference. Through exchange with taiko groups abroad, we welcome more visitors to Sado Island from around the world to join us in international cultural exchange here. 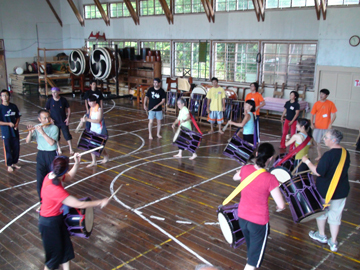 Kodo Apprentice Centre welcomes people from around the world for live-in workshops, where participants live communally with the apprentices and study taiko, bamboo flute, and dance with Kodo members.